The evolution of the book can be an alarming concept to lovers of the printed page. The image often associated with evolution depicts the ascent of man, in a stately progression from apelike creature on all fours to upright human. Applying this image to publishing, some may be tempted to cast the printed book in the role of knuckle-dragging cro-magnon, destined to oblivion. 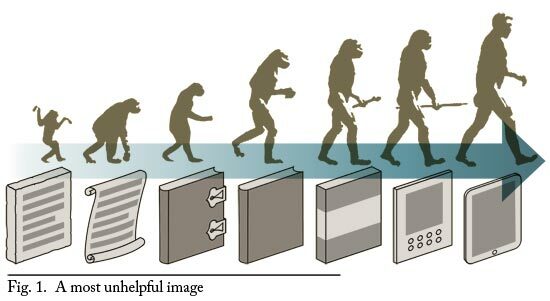 The thing is, evolution doesn’t really work like that, and this image is no more apt for publishing than it is for biology. 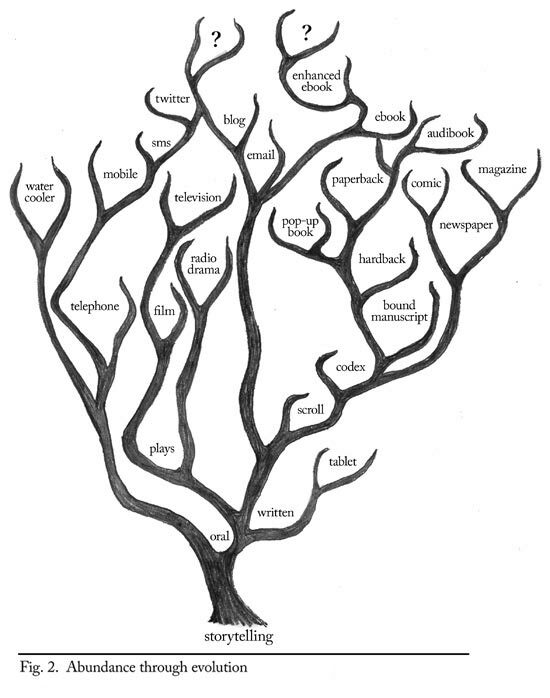 Instead, think of books as Darwin’s finches, taking off from the mainland of ink on paper, and populating an archipelago of electronic devices. Each island has its own unique terrain and ecosystem. Screen size, the availability of colour, of motion graphics, of touch screen or keyboard input, the presence or absence of network connections, GPS, accelerometers, all the contours and constraints of hardware an software; these are the cliff faces, the watering holes, the high and low branches with which the migrants have to contend and to which, like the finches of the Galapagos, they must adapt. Arriving on these new shores, books will encounter other species and, unbound by biological constraints, they will mate. Strange inter-species couplings like something from J.G. Ballard will occur; books combining with video, with audio and with software; vast orgies of books and entire social networks. The progeny of these unions will be many and varied. Some clumsy and ungainly at first, others brilliant and revolutionary. Some will perish quickly while others thrive, passing on their succesful characteristics to future generations. Already new species are emerging, with a rather awkward nomenclature – enhanced ebooks, vooks and so on. As the evolutionary process progresses, we will need new names and new ways of talking about the species that emerge. The real divergence will come with content created specifically for these new habitats, rather than simply as alternate versions of projects conceived primarily for print. In some cases these species may deviate so far from what we know as a book that any allusion to that word in their name will be inappropriate. The book will have evolved to such a degree that it no longer makes sense to call it a book. What a dismal prospect it would be, this brave new world in which the book disappears, supplanted for all time by its upstart descendants. The thing to remember though is that evolution is not a linear progression, but a process of creating new branches on an ever-growing tree; the emergence of a new species does not necessarily mean the demise of its predecessor. Yes, some species do disappear, either through extinction or incremental change. Evolution can be a messy business, replete with false starts and dead ends. Even vigorously healthy and successful branches can wither or be cut short. But the overall result of evolution is variety and abundance. Generations of adapting to new environments changed those Galapagos birds into something very different from their ancestors, but back on the mainland, the earlier version remained handsomely adapted to its surroundings and continued to flourish. Similarly, the emergence of ebooks and their as yet unknown and unnamed descendants, should not necessarily herald the demise of the book as we know it, which remains eminently suited to its ink-on-paper habitat. And just because something is possible in an electronic habitat does not mean it is a requirement in every case. As long as people retain the desire to tell one another stories in words, the book and its close electronic cousins will continue as part of a richer and more diverse ecosystem. The real engine of evolution is competition for resources, and here the Galapagos analogy breaks down somewhat. Unlike the geographically isolated bird species, pbooks and ebooks are in direct competition for the same resources – the time, attention and in many cases money of the reader, (not to mention those of the creator and the publisher). This competition will drive the evolution of print books as well as their electronic counterparts. The most succesful species will be those that excel in a given area, whether that is quality of presentation, content or price. And the reader will benefit. At one end printed books will have to work a little harder to justify their place on the shelf, while ebooks will offer increasingly valuable experiences and utility. Lest this sound entirely utopian, it should be noted that survival does not connote any objective merit, merely a level of success within the constraints of a given time and place. Some great ideas will fall by the wayside, and some less than great ones will prosper. This is nothing new, as a visit to any high street bookshop or a flick through the TV guide will attest. But, there are many and varied paths to success, and with the capability of electronic distribution to support long tail demand, the level of success required to survive is lower. What we will get is experiments, innovation and above all variety. Fantastic, joyous, thrilling and boundless variety.